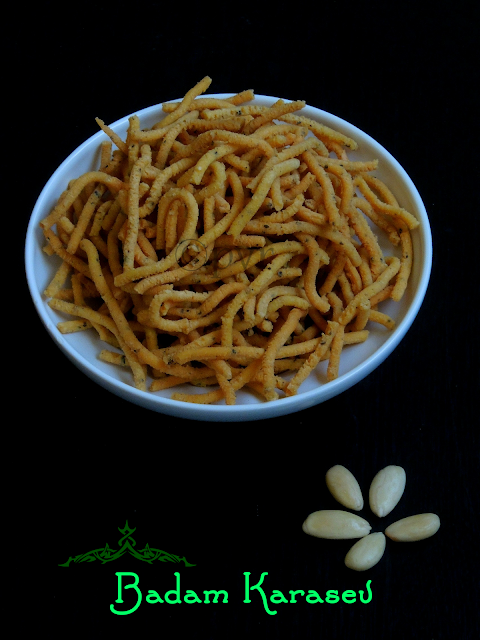 Murukkus/chaklis, sev and then karasev have their important place in our Diwali savouries,for a change i tried adding some grounded thick badam paste while making karasev this time,trust me these karasev are just simply out of the world. They were crunchy,very addictive with a melt in mouth texture. You can just stop with one, adding badam aka almonds to the karasev makes this savoury very interesting than the usual karasev, also i used coarse pepper powder to spice them instead of chilly powder. Instead of making the usual Karasev, try to almonds in your karasev and see the difference. Hope you are all busy with Diwali preparation and shopping, i miss all those fun here, but am happy that kids and H will be at home this time coz Diwali falls on saturday.Obviously i'll start my diwali preparation only on thursday as i dont want to make everything earlier, also this time its not going to be big celebration here. A simple pooja with some savouries and sweets is quite enough to celebrate the Festivals of Lights, however this is how we are celebrating Diwali every year here. This beauties are going Diwali Delicacies Event, hosted by me and Sangee Vijay of spicy treats and to Gayathri's Diwali Special.Today is the last thursday of the month and its time to post for Vegan Thursdays, an vegan event running twice a month and these crunchy munchies goes to this event too. Pina colada is a sweet rum based cocoktail prepared usually with rum, coconut cream and pineapple juice, usually served either by blending together or shaken with ice. Actually this drink tastes fabulous, if you go for this combination in a cake you can call the cake as pina colada cake. This cake was this month's challenge of Baking Eggless,a monthly event owned by Gayathri. The member of this group should convert a egg based baked goodies to an eggless bakes with available egg substitutes, each member of this group come up with their eggless bakes and this group is running successfully more than a year. 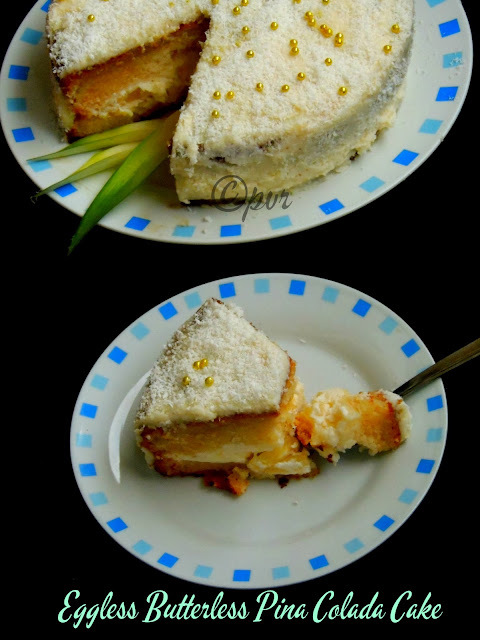 This Pina colada cake was challenged by Meena Thenappan of Chettinad Fiesta. Thanks Meena for challenging us with this fabulous cake, i prepared it during this weekend with a eggless and butterfree vanilla-pineapple sponge cake and frosted this cake with mascarpone cheese-coconut cream. I went for both fresh and canned pineapples along with storebought mascarpone cheese,coconut cream. This cake turned out extremely spongy, very fruity and extremely delicious coz of both pineapple mousse and coconut cream prepared with mascarpone cheese and coconut milk. This cake suits prefectly for celebration like birthday,get together or else a kid's party. This cake may sounds rich but somehow they are low fat coz this cake is completely butterfree and eggfree. The whole cooking process may sounds long and time consuming, but this cake is worth to try.Sending to Srivalli's Cake Mela. 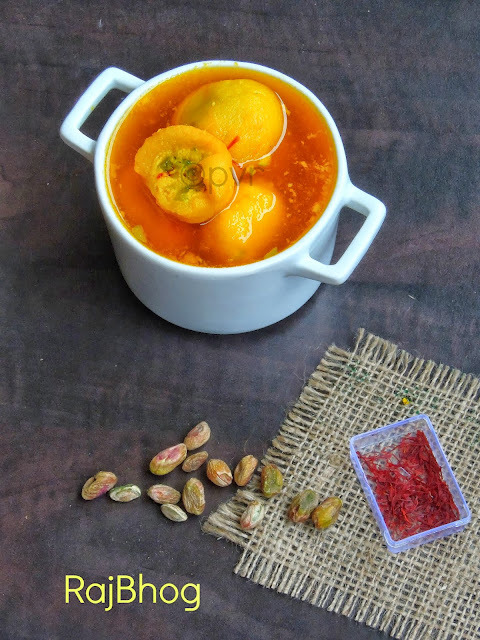 Cant imagine Diwali without a sweet, if you are searching for an easy and a delicious sweet which goes for simple ingredients with less efforts this Sindhi sweet Tosha will come in secure. Yes this delightful Tosha goes for all purpose flour or maida, curd and baking soda, with a simle sugar syrup. This is a very easy,quick and very addictive sweet which can be stored for many days in an air tightened box. Tosha tastes almost like our South Indian badusha, but the shape is different from the former one. Actually when i was searching for a quick sweet, i got this Tosha from here, thanks Nivedita for sharing this incredible sweet which gets ready in a jiffy. As i told earlier, with less efforts you can make these cuties if you dont want to spend more time in your kitchen during festival. You dont know how to make badusha and want to make a sweet which tastes similar to it, just makes this toshas and enjoy it.This beauties are going Diwali Delicacies Event, hosted by me and Sangee Vijay of spicy treats and to Gayathri's Diwali Special. After making Rajma murukku and Ragi omapodi, here comes an another different and completely new chakli i prepared few days back with some cooked kollu aka horsegram. These wonderful tiny beans are very rarely cooked in our cuisine, eventhough these beans are highly healthy and very nutritious. These beans are well advised for dieting peoples and whoever wants to reduce their weight. Frequent intake of these grains helps a lot for weight reducing. 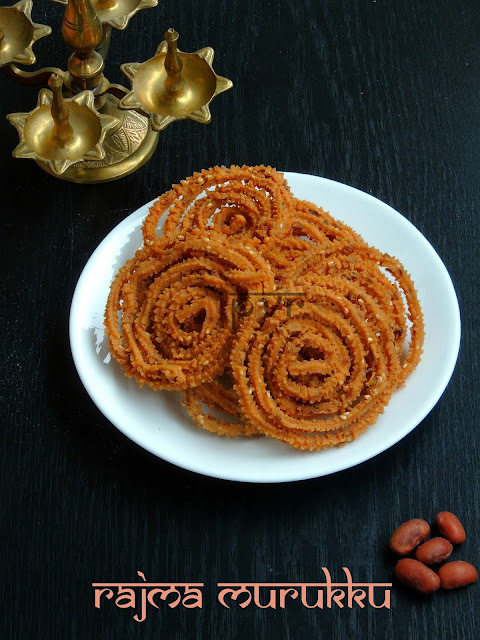 Coming to this interesting bean based murukku, i prepared them with a cup of leftover cooked kollu, along with gram flour, rice flour with usual ingredients. These crispy murukkus are dangerously addictive, seriously none at home will notice the addition of horsegrams in this murukku until you reveal the 'secret ingredient'. Make these different murruku for the upcoming Festival of Lights, if you dunno still wat to make for your Diwali savouries just give a try to this fried beauties.This beauties are going Diwali Delicacies Event, hosted by me and Sangee Vijay of spicy treats and to Gayathri's Diwali Special. Ambur is a town which is in Vellore district of Tamil Nadu, this town is very famous for few dishes especially their briyani, and some sweets coz this region was reigned by Nawabs of Arcot.This place is famous for its spicy non vegetarian cuisine made with chicken,mutton or eggs in the form of gravy or kebabs. Ambur biryani is one of the famous South Indian dish which is emerged during the Nawabs's regime. This is prepared just to serve the army during the Nawab's regime as it was difficult to prepare rotis or parathas to feed the need of lakhs of soldiers. Today this dish is served in many occasions especially in Arcot muslim's weedings along with some regional foods. 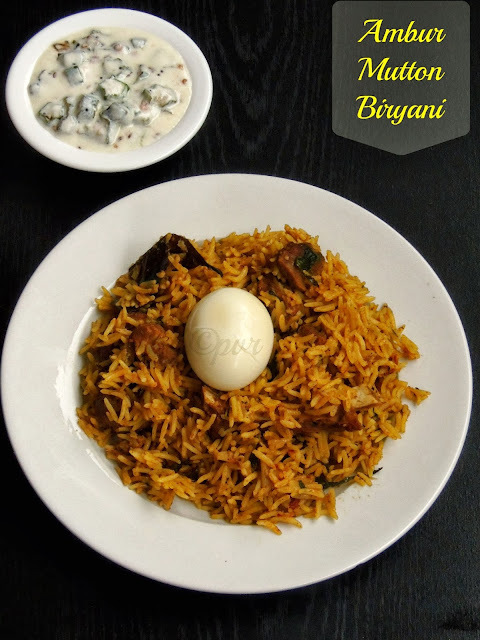 A plate of biryani with a brinjal curry and onion raitha makes a fabulous feast, i tried my hands in preparing this wonderful famous Arcot briyani at home and they came out extremely delicious. You can serve this food for any occasions, if you are a vegetarian,just add any veggies instead of meat and make them.If you are biryani lover like me, seriously you have to give a try to this dish.This recipe is from a paper cut of Hindu news paper.Its 4th sunday of the month and since i belong to a group of friends who blogs on sunday for the event Let's Brunch On Sundays am posting this incredible delicious Ambur biryani today. I love the traditional carrot cake very much topped with cream cheese frosting,but somehow none at home arent that much fan of carrot cakes. They can have it just like that if i insist them, this time when i prepared this carrot chocolate chips cakes, trust me they just vanished within few hours coz this cake turned out extremely spongy and its completely sugar free coz i used thick palm jaggery syrup for making this cake. Also this cake is low fat coz i skipped completely butter here as i went for oil and yogurt. 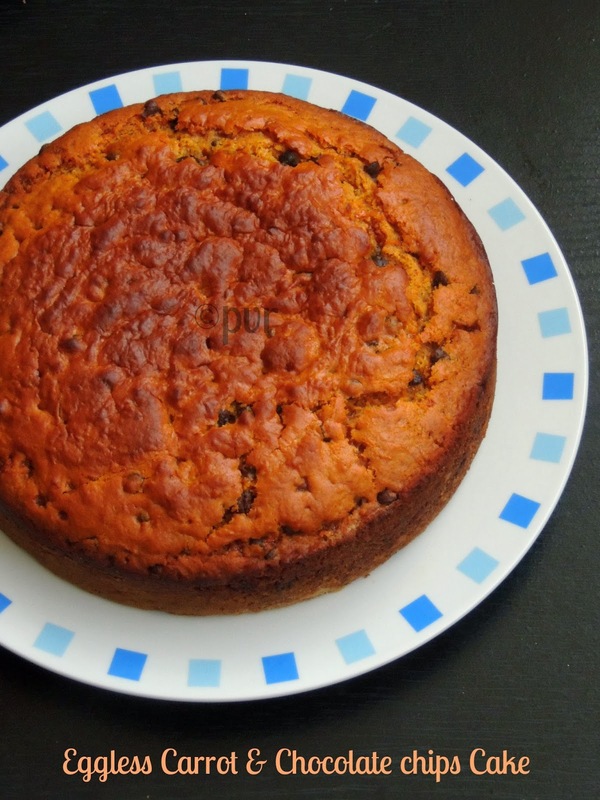 Just a manual hand beater is enough to make this incredible bake, finely grated carrots and chocolate chips works extremely prefect for making this ultimate spongy cake.Chocolate chips at every bite of this cake will definitely makes the difference, since i went for palm jaggery syrup you can enjoy this cake thoroughly without any guilt. I used flaxseed meal as egg substitute here,if you are searching for a simple spongy cake for your evening snacks,you have to make this cake.Check out the Blogging Marathon page for the other Blogging Marathoners doing BM#33.Sending this cake to my event Healthy Diet - Fat Free Recipes guest host by Dhanish.Sending to Srivalli's Cake Mela. Dried figs are excellent source of minerals like calcium,copper,potassium,iron and many more. In fact they tastes fantabulous in shakes,in bakes or just add them in salads. Although dried figs are available throughout the year, we get them abundantly during the xmas time here.Dried figs are sweet and often eaten as a favourite snack between meals. Adding dried figs into your daily diet can help you to keep your body's everyday nutrient needs. If you have a sweet tooth instead of consuming extra fat, just munch these dried beauties,am sure they are the prefect treat for your sweet tooth since they are sweet and low in fat. I have prepared a homemade dried figs puree with some leftover dried figs, which i used in this cake along with banana and walnuts.Since my theme of this week's blogging marathon is eggless cakes, i baked this cake few days back for this theme,we enjoyed thoroughly this healthy and very nutty super moist cake. Banana puree and dried figs puree both works wonder together and we loved this cake when its was still warm. Walnut brings the nuttiess to this cake, obviously this cake is an incredible snack time cake. If you have some leftover dried figs, do give a try to this fantastic cake since this cake is butterless,eggless and sugarless as i used honey instead of sugar.Check out the Blogging Marathon page for the other Blogging Marathoners doing BM#33.Sending this cake to my event Healthy Diet - Fat Free Recipes guest host by Dhanish.Sending to Srivalli's Cake Mela. I must confess here that i dont like baking bread completely with wholewheat flour coz i have made bad experience with them earlier. Later i slowly learned them and one fine day i succeeded making an incredible 100% wholewheat bread. Somehow none at home like wholewheat bread as they will be bit dense when compare to the bread flour or all purpose flour used bread. If am making bread at home, either i'll make completely with bread flour or else i'll go for both whole wheat and all purpose flour. But its been a while i prepared wholewheat flour bread without all purpose flour. 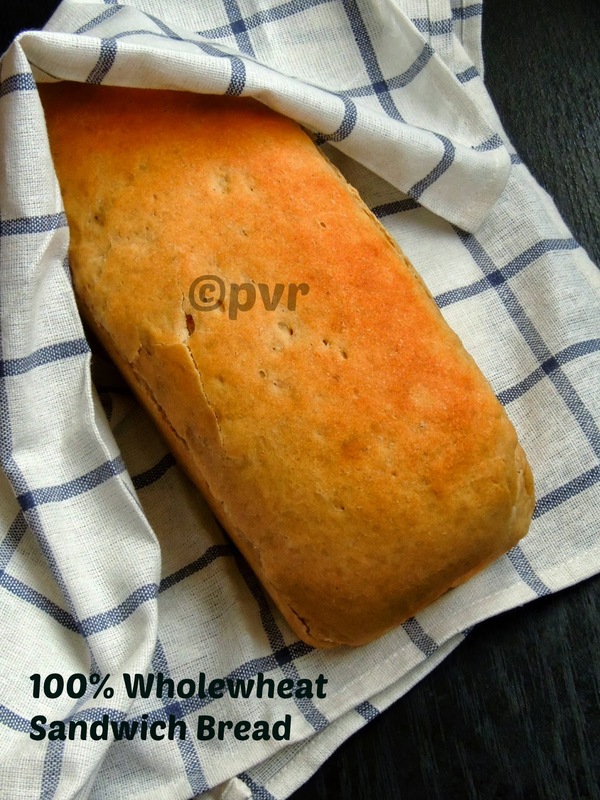 For our this month's We Knead To Bake, a monthly baking event by Aparna of My Diverse Kitchen, she pulled us to bake an incredible wholewheat sandwich bread. Initially i was bit skeptical coz this bread goes for almost a day preparation. Yes, this bread goes for soaked and the biga/sponge,obviously if you are planning to make this bread you have to start your preparation better before a day. Coz the soake need to be in room temperature for atleast 12 hours and the biga/sponge need to be in fridge for almost 12hours too. But trust me this both part are very important to get this extremely spongy and prefect loaves of this wholewheat sandwich bread. Aparna also shared a video of shaping a sandwich loaf which helped a lot for making this loaf, check here.I used Aasirvaad atta for making this loaf and we had this spongy bread for our lunch with some salad and grilled meats.Sending to my own event Cooking With Seeds- Wheat guest hosted by Priya. Applesauce cake with chocolate chips makes a prefect evening snack cake. This applesauce cake will be extremely moist,super spongy and extremely addictive coz of the chocolate chips. 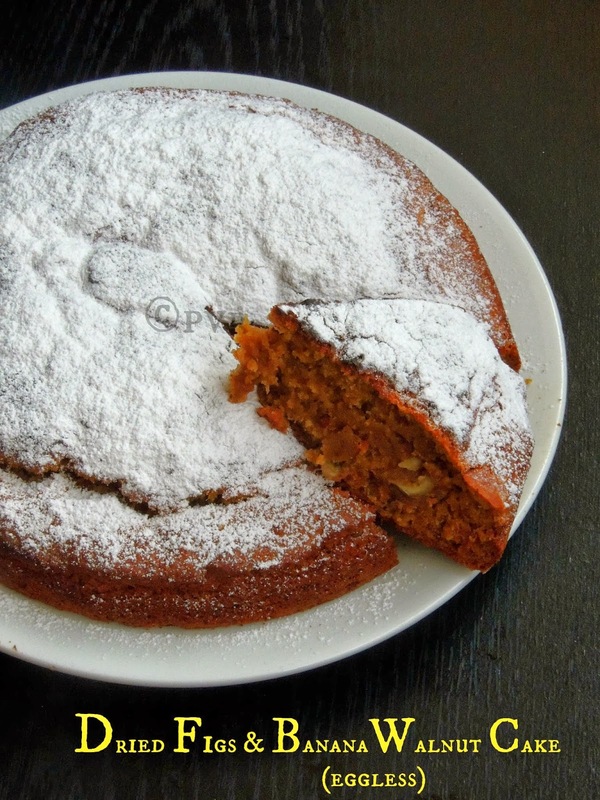 This cake is completely egg free, low fat and also vegan. I used applesauce and oil for making this cake, apple sauce acts a butter and oil with applesauce make this cake simply super moist. You can enjoy seriously this quick and easy cake for you breakfast with a cup of tea or else for your snack with a cup of coffee or milk. Y am posting an eggless cake today instead of Diwali sweets or savouries,coz my theme of this week of blogging marathon is Eggless cakes. Seriously blogging world taught me how to make cakes without eggs and i have stopped running behind eggs since a long. If i dont have eggs, i dont even bother about it and make eggless bakes with their substitutes, one of my favourite egg substitute is fruits puree. That too applesauce works wonder in eggless bakes. 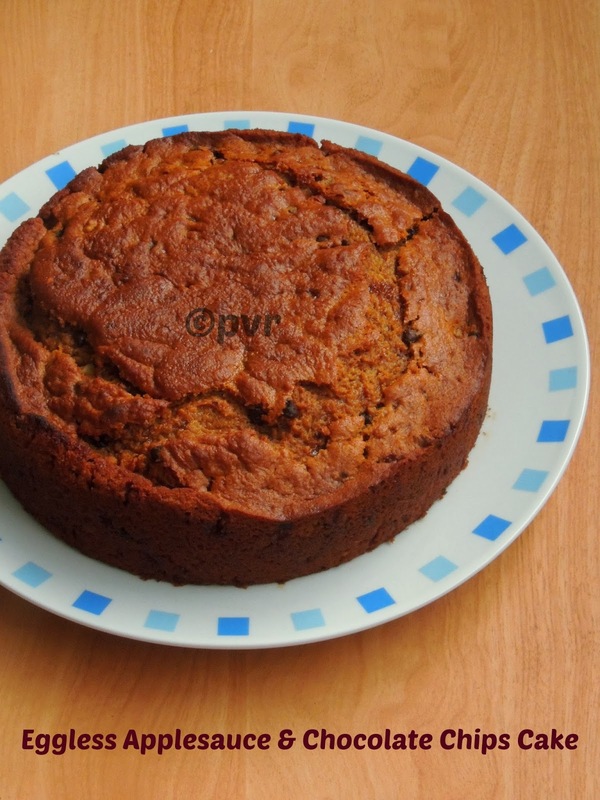 Applesauce gives a wonderful moist texture to cake, if you want to make an eggless cake, give a try to this cake. Am sure you will definitely love this super spongy and moist applesauce cake.Check out the Blogging Marathon page for the other Blogging Marathoners doing BM#33.Sending this vegan cake to my event Healthy Diet - Fat Free Recipes guest host by Dhanish.Sending to Srivalli's Cake Mela. I always keep on searching how to add wholegrains in our diet, and most of the time my culinary experiments turns simply awesome. One among those trial is this ragi aka finger millet omapodi. 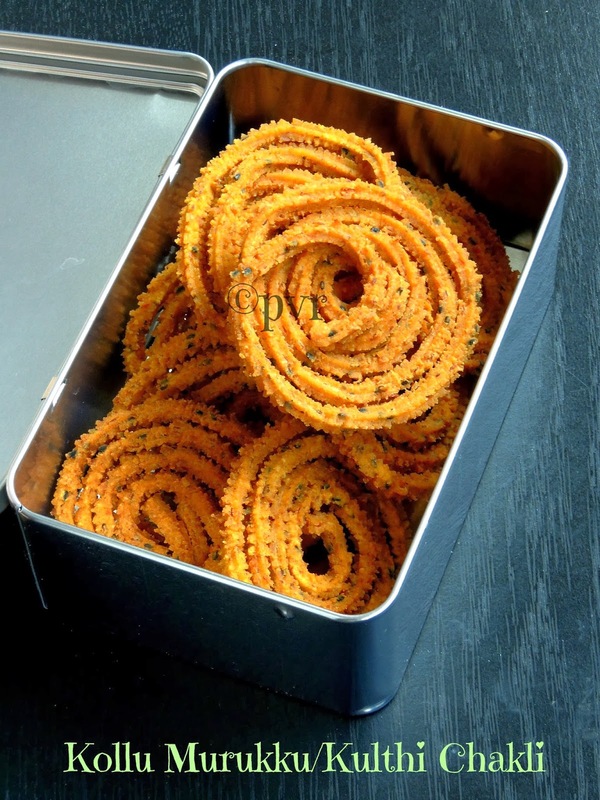 These sev are seriously very addictive and crunchy munchy as like the usual gramflour sev. I simply prepared this sev by adding roasted ragi flour along with gram flour and rice flour, flavoured with ajwain water. Such an easy omapodi na, yep they came out extremely prefect as much as like our usual omapodi. Trust me, we couldnt stop munching them and its one of my kid's favourite, obviously the colour of this omapodi will be bit different but tastewise you cant find any difference.Wat an incredible way to enjoy whole grains na that too finger millet is not my family member's favourite grain. Everytime i have to insist them to take this grain through different dishes and bakes, else none are fan of this grain. Eventhough this grain is not that much appreciated at home, i love this grain and never forget to get them from the Indian stores. Every time i'll mix them in most of our dishes to feed everyone at home easily. Make this ragi omapodi for the coming Diwali festival, go grain friends..This beauties are going Diwali Delicacies Event, hosted by me and Sangee Vijay of spicy treats and to Gayathri's Diwali Special.. Hot chocolate fudge, its been ages i had this fantastic dessert. But finally i could make some at home and thanks to Preeti of Simply Tadka for suggesting this incredible and easy breezy dessert for this month's Sweet Fantasy Club. Few scoops of vanilla icecream and a simple hot chocolate sauce is enough to make this incredible dessert. 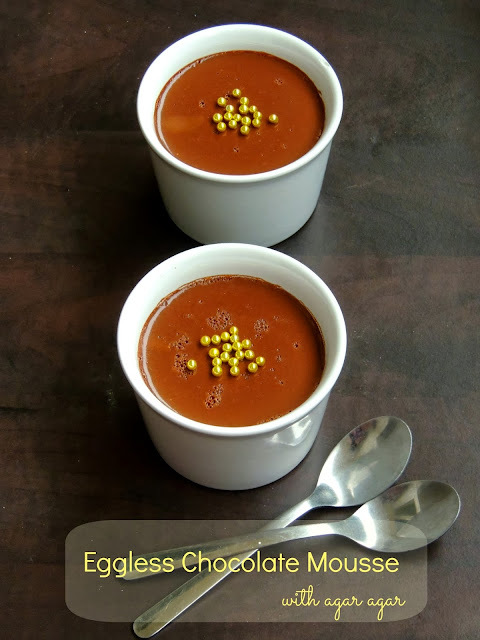 My kids enjoyed thoroughly this incredible dessert and asked me again to make this chilled dessert.A quick hot chocolate sauce topped over few scoops of vanilla icecream makes this fantastic hot chocolate fudge. Eventhough the weather is too cold, we seriously enjoyed thoroughly this dessert, my H have completely fallen in love with this dessert. Definitely this dessert is a real feast for both icecream and chocolate lovers. I went for vanilla icecream and homemade hot chocolate sauce which i simply prepared by melting chocolate chips in double boiler. If you want to change the flavor of the icecream just go with your favourite flavor. Kesari Raj bhog, have you ever tasted this fantastic and succelent juicy stuffed rasgullas?? if not you are seriously missing something. Actually i never had a chance to taste of this fantastic sweet until Preeti of Simply Tadka suggested this beautiful sweet for this month's Sweet Fantasy Club where we can learn many sweets and desserts. Actually this sweet club is open to whoever have sweet tooth and love to learn many different variety of sweets and desserts.Every month, the members of this group cook two different sweets or desserts and blogs on their blogs. 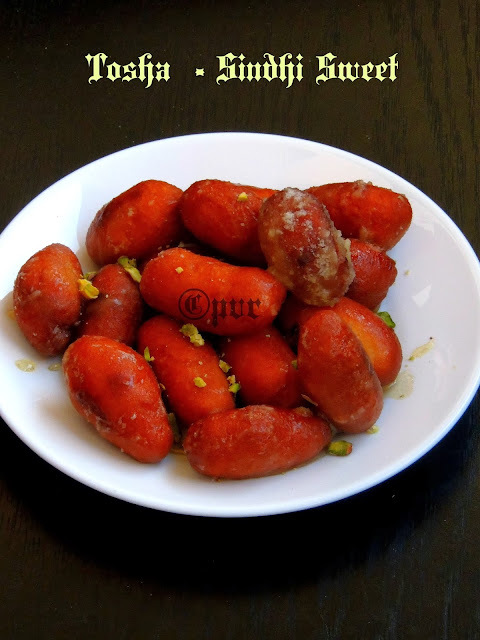 One of the sweet goes for Indian sweets and the second one goes for International or fusion desserts, seriously i dont want to miss this chance to learn different sweets and joined the group immediately. For this month we have Kesari Rajbhog for Indian sweets and hot chocolate fudge for International or fusion. This Rajbhog is from Sanjeev's Kapoor and trust me these juicy,softy stuffed rasgullas are just amazing and seriously you cant stop having just with one. They are simply fantabulous and truly an excellent sweet to make and enjoy for a celebration. 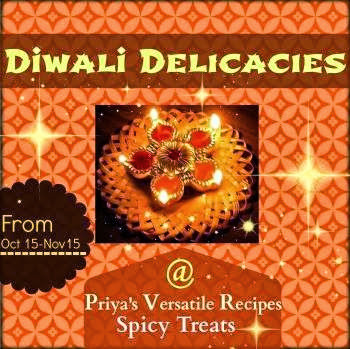 Dont wait, make some and celebrate diwali with this incredible sweet..This beauties are going Diwali Delicacies Event, hosted by me and Sangee Vijay of spicy treats and to Gayathri's Diwali Special. My readers and followers will definitely know that every 7th and 20th of the month i'll be inviting two newbie bloggers from this bloggy world to write a guest post in my space. If anyone want to be my guest and if your blog is less than two years please do contact me through Facebook or by a mail with your facebook name to add you in this new adventure. Hope many of you will join ur hands with me. Obviously the motto of this event is to introduce the upcoming new bloggers to this immense virtual world. Blogging,this immense virtual world is definitely very close to my heart, i gained a bunch of good friends, well wishers and many blogger sisters. My today's guest is also one among them and she was a wonderful person who blogs at Nitha's Kitchen. Actually i crossed her before a year and we became closer to each one through FB. She is one of my best friend, a sweet sister and a young mom of two kids who blogs frequently with healthy stuffs. She shares many traditional dishes from her native which are seriously very close to my heart and the list of my favourite dishes from her space is very long.She shares stepwise pictures of her recipes, also she will give definitely DIY ideas and one among those is her pumpkin cookies, check her idea here really tremendous and brilliant na,she have many interesting recipes like this and sure her space is definitely a treasure, if you are searching Kongunadu style dishes. I am Sangeetha Priya, started my career as Computer faculty in School and simultaneously finished my master degree. I worked in MNC as Software Engineer for few years n now full time home maker lives in U.S with my hubby and 2 kids. I blog for Nitha Kitchen which is almost 1 n 1/2 years old. Nitha is my daughter name, she just started her preschool n younger son is staying at home. My cooking remains the same but improved a lot in baking also do experiments especially with it. Now I have started cooking for a varied audience from different places of the world. I get recipe requests from my Readers, friends and family members living in home town, so blogging molded me and happy to share the recipes. Also I learnt few terms like Vegan and because of it my photography skills is improving. Before marriage like everyone says I never involved in cooking. After getting married I quit my job and was alone at home that made me to develop my cooking skills. Later I was so crazy to click step by step pictures, it’s my hobby and love to share the final outcome with my parents. It went like that for almost 2yrs with loads of recipes, one special day we invited our close friend for lunch and she suggested me of starting a blog. My Husband then helped in creating it. He helped a lot in domain change, template designing so and so. It’s a mix of traditional Indian n trendy unique recipes. I have loads of healthy and reduced fat recipes. Most of them are prepared with easy homey ingredients and simplest process; also I explain it with step by step pictures. My Mom, Maternal Grandma and Aunt (Paternal Sister) are my great inspiration. 6)Every newbie blogger faces tons of challenges when its comes to blogging, tell me about one of the challenges you faced and how did you overcome it? Initially I designed my site by referring Raks and Sharmis space. I hard coded by searching various sources in Google. When getting stabilized by mistake I moved the blog to my daughters own domain without thinking about the future. We realized later and moved to my new and existing domain. My husband helped a lot in domain change. Also I appreciate my Co bloggers with their activities in Facebook groups n other social medias, I learnt several new aspects. Particularly I thank Sangee and Preeti for my tuned pictures. All my recipes are favorite, here are few of my best n favorite foods: Ancient Thinai Urundai/Foxtail Millet Honey Balls, Arisiyum Paruppu Sadham, Almond Pista Rolls/Apple Shaped Almond Katli, Keerai Bajji/Gram Flour Spinach Fritters, Bitter Gourd Pulav/Pavakkaai Pulao, Thinai Murukku/Millet Chakli, Eggless Pomegranate Cupcakes with POM Cream Cheese Frosting. I am not a great photographer but to my knowledge I suggest taking pictures in natural light and also in different angles. I don't have any budget, depends on the shop and H mood , it varies from 1 to 20 USD. I usually manage with my household stuffs but in future I may hunt for it. By regular I post weekly 3 recipes at least, If I get time I increase the count, anyways it depends on the kids at home. 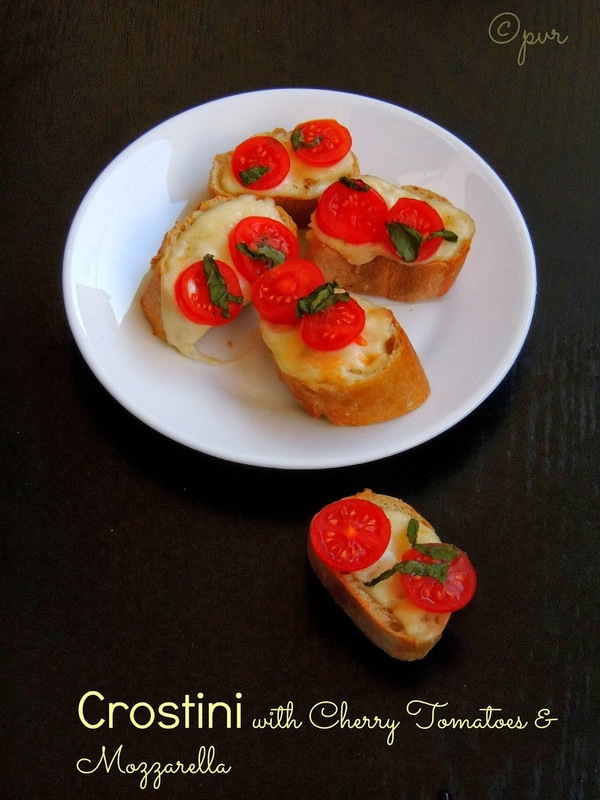 Today’s recipe is simple and delicious savory snack and my mom makes this especially for dinner. 3-4 soiyans aka South Indian kachoris is more than enough for a person. 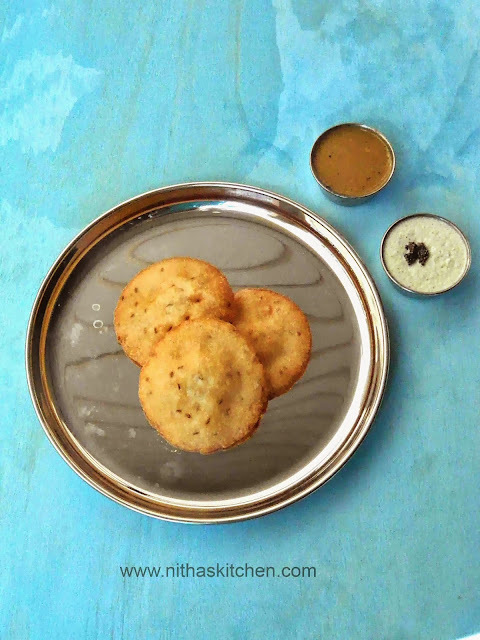 This kachoris' are made of rice batter and no needs fermentation, you can use mixie/blender to grind the batter. When added in hot oil it gives “soi” sound so we call it as Soiyan in our surroundings. I am not a frequent deep fry maker but once in a while I make it for dinner as Mom's recipe are something special right .The best side for this fritters is spicy coconut chutney. Soak Rice, Urad dal and fenugreek for at least 5 hours (Stepwise Pic 1, below). 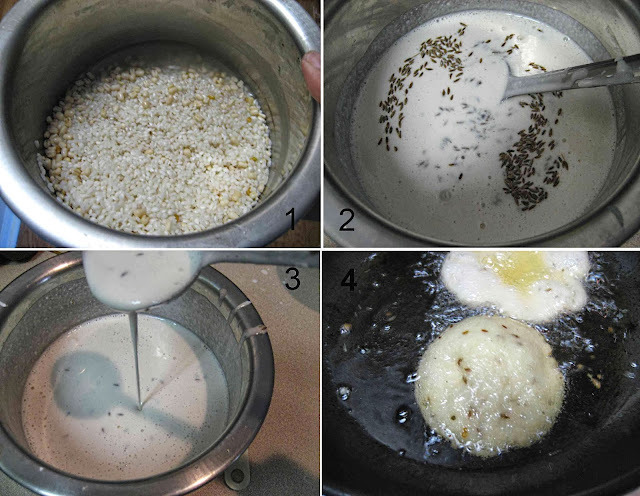 Grind to fine paste, make the batter bit watery when compared to usual idli batter (Pic 3). Add cumin and salt to the batter, keep it aside for 15 minutes (Pic 2). Meanwhile heat oil in a small pan/kadai, drop a ladder full of batter in the center of the pan, It pops up very well (Pic 4). You can another spoonful of batter after the first one raise up (Pic 4). The fritters once starts changing light brown, flip it and cook both sides well ie till nice golden color. Remove and drain the excess oil using paper towel, also you can wipe well with paper towel, if needed. 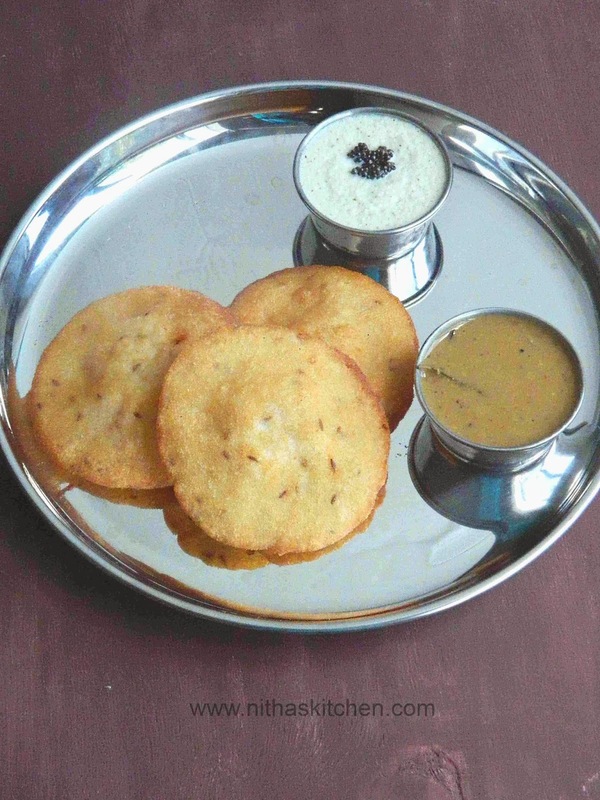 Coconut chutney is the best accomplishment for this kachori, also paired with dal/paruppu sambar. 1. It depends on the rice, you can take it out when it is light brown and make sure it is well cooked inside. 2. If the batter consistency is thin then you get crisp outer coat, if its thick, then it attains soft kachoris. Hope you enjoyed this fantastic Kongu dish and stay tuned for an another guest post by an another foodie blogger..
After two delicious dishes from two different chefs, here comes one more interesting and nutritious dish from an another chef who is definitely a humble and fabulous person who can dish out dishes from a prison, in a middle of river, in a farm, before a hotel etc, the list can go for a long. He is none other than Chef Jacob, he is no more with us but he is still living with us through his Tv shows.Am an ardent fan of his shows and never failed to watch him. Not only he cooks different dishes, he always chose a unique place to cook his dishes for the show, coz most of the chefs make their shows in a studio with all equipments and ultra modern stove tops while Chef Jacob cook simple with a normal stove in front of normal peoples like us.I know i'll be making one of his dish for this week's blogging marathon as i chosed favourite celebrity chef as theme. 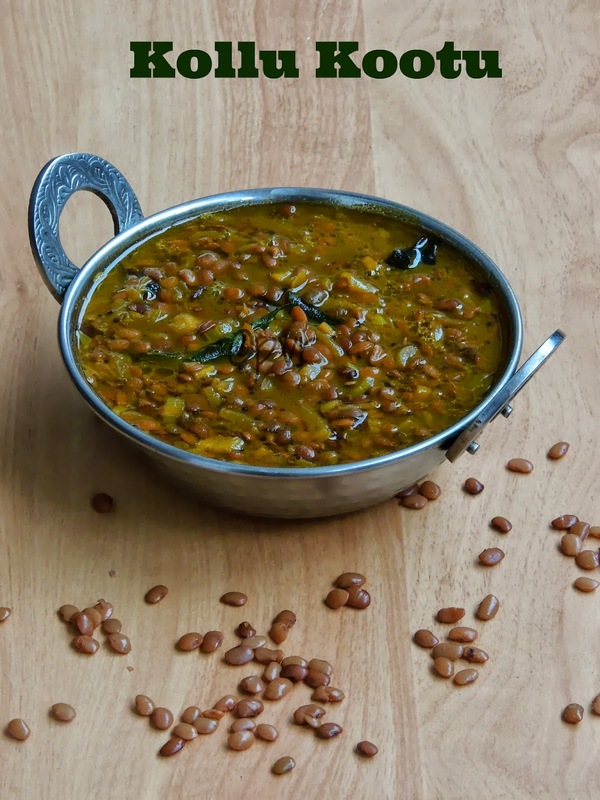 Coming to this kollu kootu,its a super simple recipe which goes for cooked kollu aka horsegram.Horsegram is well known for its nutritional values and its very recommanded to dieting people. I love anything cooked with this incredible horsegram and obviously i chosed this dish from one of Chef Jacob's tv show which i noted long back. Finally i prepared this dish for our lunch two days back and enjoyed thoroughly with rice and egg masala. If you love horsegram very much, you can eat this kootu just like a snack too,yep i finished the leftover kootu as a snack after my lunch.Check out the Blogging Marathon page for the other Blogging Marathoners doing BM#33..Sending thi kootu to my event Healthy Diet - Fat Free Recipes guest host by Dhanish, Srivalli's Side Dish Mela and to WTML guest hosted by Asiya, event by Gayathri. 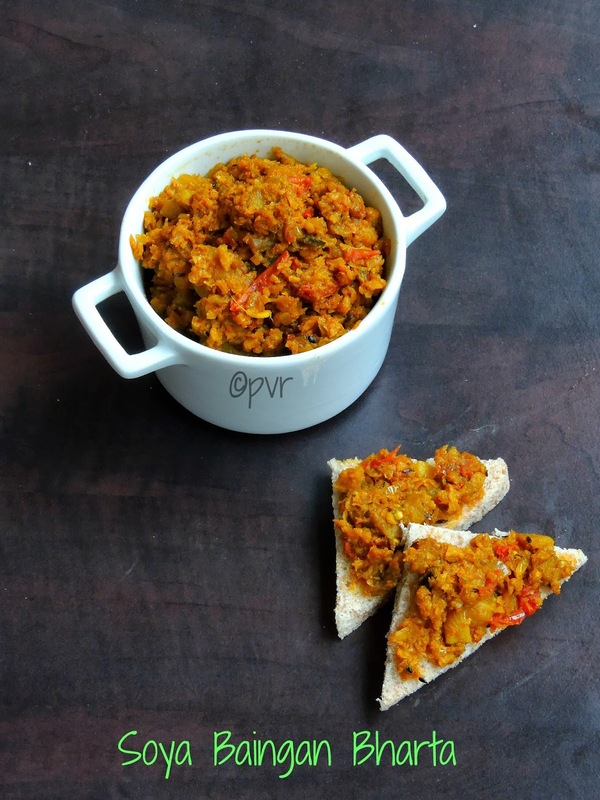 Baingan bharta is my all time favourite dish, every time i search for a different bharta recipe. While going through my cookbook collection, finally i got an interesting baingan bharta from Sanjeev kapoor book.Sanjeev Kapoor the famous Indian chef who cook fabulously with anything doesnt need any introduction among Indians. While going through his cookbook, i got this soya baingan bharta,immediately i cooked this protein rich baingan bharta for our lunch. This dish tastes fantabulous with rotis also goes awesome as a filling for making sandwiches. Roasted eggplant and minced soya works wonder in this dish, an incredible side dish to sneak soya granules in your diet. Am running this week's blogging marathon with Favourite Celebrity Chef Recipes as theme,obviously this soya baingan bharta suits prefectly for the theme. If you are searching anything new,delicious,healthy and a quick side dish, just make this protein rich baingan bharta with both eggplants and minced soyachunks am sure everyone at home will definitely love this fantastic dish.Also this soya baingan bharta is definitely a wonderful dish to feed the protein packed, nutritious soya granules to everyone at home.Check out the Blogging Marathon page for the other Blogging Marathoners doing BM#33.Sending to Srivalli's Side dish Mela..
Wat to do with over cooked mushy rajma beans, either some of us makes tikkis with it or else make a stuffing with some spices for prepared stuffed parathas. I tried those both way of cooking to finish some overcooked rajmas eventhough some were sitting sadly in a my fridge. Seriously i want to finish them as soon as possible and tried them adding while make murukku aka chakli yesterday. Trust me the outcome was just fantabulous, initially i had a doubt whether the addition of rajma may absorbs much oil while frying the murukkus, but i was wrong they are just amazing. Apart from the addition of thick rajma paste, these murukkus goes for usual ingredients. The addition of this rajma paste makes this murukkus just crispy,mildly buttery and extremely addictive. Eventhough these beauties are deep fried, once in while we can make them at home,also Diwali is around the corner.We are celebrating Diwali this year on 2nd November, if you still dont have any idea about a savoury dish for diwali celebration, make this crunchy munchies and celebrate diwali differently.Am very proud that one more creation of mine came out extremely prefect. They are just addictive and you cant stop urself just with one.This beauties are going Diwali Delicacies Event, hosted by me and Sangee Vijay of spicy treats and to Gayathri's Diwali Special..
Today am running my third week of blogging marathon with an interesting theme, trust me i seriously loved this theme, do you want to know about this week's theme? ?.The theme of this weeks is Favourite celebrity chef recipes. I have many favourite chefs and i have huge collections of their bookmarked recipes either through youtube or in their respective blogs or in their books. Seriously i have to break my head to chose three among my favourite chefs, wat to do finally i went for my most favourite three chefs. For today's post, i chosed to cook from Chef Damu, he is an excellent chef who also hold a Guinness world of record and one of the adorable judge of a well known cooking competition. Chef Damu shares variety of cuisines obviously i have a couple of favourites. One among those favourite is this curryleaves garlic kuzhambu aka Karuvepillai Poondu Kuzhambu. The interesting part of this gravy is curryleaves are grinded as a paste and cooked along with other spices which sounds prefect for me coz my family members everytime thrown away the curry leaves. 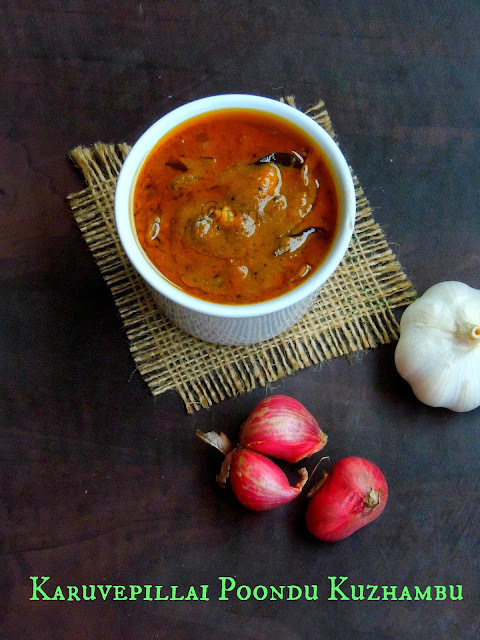 Atlast i can feed them with this healthy herbs, this kuzhambu goes for shallots and garlic and definitely this gravy goes awesome with rice and breakfast dishes like idlies or dosas. Highly flavourful and fingerlicking kuzhambu tastes much more best after a day, everyone at home enjoyed thoroughly this gravy.Check out the Blogging Marathon page for the other Blogging Marathoners doing BM#33..Sending to Srivalli's Side dish Mela and to WTML guest hosted by Asiya, event by Gayathri. One more interesting and a spooky halloween bakes from my kitchen..After Eggless Spooky Witch Fingers, my long time wish of making mummy cupcakes is finally accompalished and i have to say big thanks to Nalini Suresh of Nalini's Kitchen for suggesting this mummy cupcakes for our this month's Home Baker's Challenge. The recipe Nalini suggested goes both for eggs and butter, since i dont want to make my cupcakes with eggs and butter, i skipped them both and replaced it with yogurt and flaxseed meal. Those chocolate cupcakes came out extremely spongy,super moist with a wonderful coffee flavour. Also for the frosting, i went for mascarpone cheese frosting since i found that this frosting is very easy and less fatty when compared to the butter cream frosting. 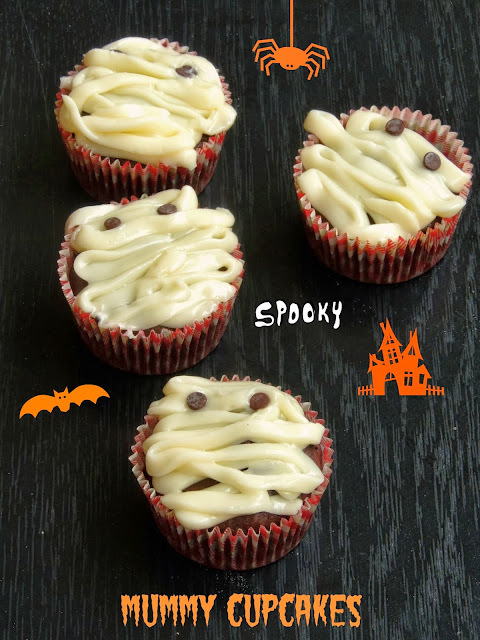 If you want something different and spooky for the coming Halloween celebration,just give a try to this spooky but cute and adorable addictive cupcakes. My kids enjoyed thoroughly this mummy cupcakes especially the mascarpone frosting.Sending to Srivalli's Cake Mela. Actually dunno whether this post need an introduction, all of us know the medicinal value of dry ginger and also needless to say how healthy amlas are. Seriously these both dry ginger and dry amla makes an incredible home remedy for cough and cold. 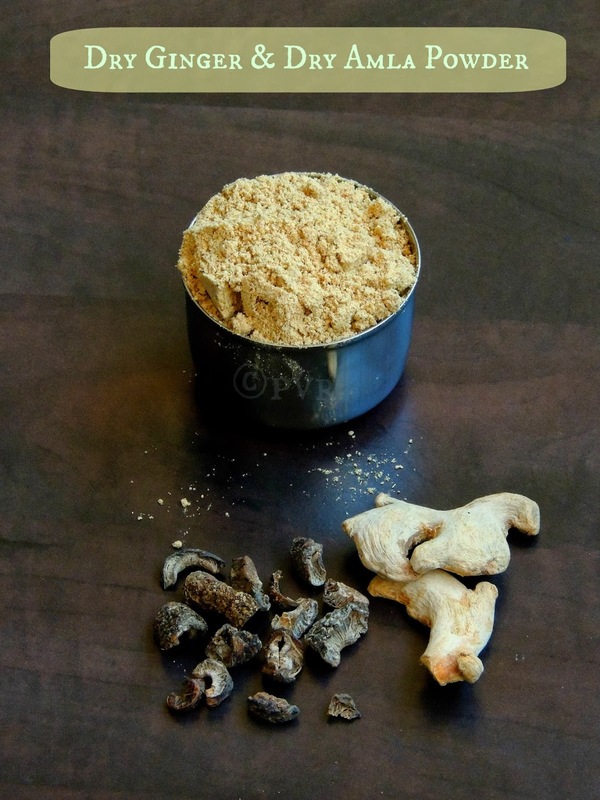 I simply prepare a drink with this spice powder whenever i was suffering from both sore throat and cough.Trust me with frequent intaking of this concoction will helps you very much and they works wonder anytime of the day. Simply add a teaspoon of this powder in a boiling water, bring it to boil, strain the water and drink with palm sugar, and see how wonderfully they works while you are suffering from the cough and cold. 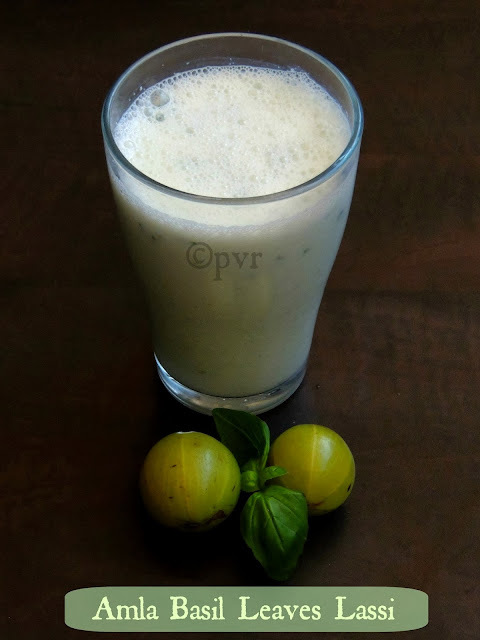 One of my recent favourite is this dry amla, my mom got them during her last trip to India from an organic shop.No problem, if you dont get dry amla pieces and dry ginger, you can make this drink with fresh ginger and fresh amla pieces, just crush both and bring them to boil with crushed black peppercorns and coriander seeds, your concoction is ready to drink.Sending this home remedy to my event Healthy Diet - Fat Free Recipes guest host by Dhanish and to WTML guest hosted by Asiya, event by Gayathri. Welcome you all to an Another Interesting Event - Diwali Delicacies. Diwali or Deepavali popularly known as the "festival of lights," and is Celebrated all over India. Diwali involves the lighting of small clay lamps filled with oil to signify the Victory of good over evil. These lamps are kept in order to Welcome the goddess Lakshmi. And also on the special day Firecrackers are burst because it is believed that it drives away all evil spirits. During Diwali, all the celebrants wear new clothes and share sweets and snacks with family members and friends. And Diwali is one of my most favorite festival, from my childhood days i have a special liking to this Festival of Light. Mainly because of the more sweets and savories made on this special day. After blogging my liking towards this Festival of Light has increased and this year i wanted to celebrate this Grand Festival with my Fellow Bloggers. Am so happy to host this Diwali Delicacies Event with my dear friend Sangee Vijay of Spicy Treats. Thank to my buddy Sangee for joining her hands with me and we both inviting all our fellow bloggers to participate in our Diwali Delicacies Event by sending their sweets, savories and all other recipes which you love to cook for Diwali and enjoy with your family and friends. 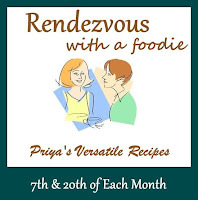 1)Bloggers & Non-Bloggers are welcome to participate in this event and you can send as many recipes as you want.Archived entries are accepted if properly linked back to both hosts pages. The event starts from 15th Ocotber and ends on 15th November. 2)Cook Any recipes - sweets & savories and also any course of meals both Vegetarian recipes & Non - Vegetarian dishes that you cook during Diwali. 3)Any bakes with eggs are accepted. 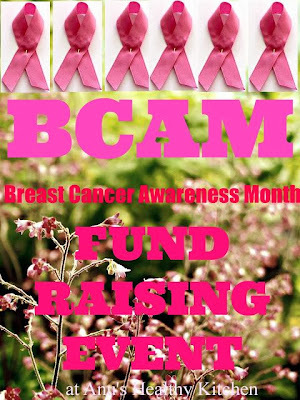 4)Using Logo is very much appreciated as is it helps to spread the word. 5)All the entries should be linked back to both this page and Sangee's announcement page. 6) Non bloggers can send their entries through mail either to Priyasuresh09@gmail.com or to sangeethaskitchen@gmail.com. Like My Facebook Page & Spicy Treats Facebook Page, If you like do leave a comment here so that we will give you a like back to your blog's Facebook Page. Pulao or biryani, i dont mind eating them anytime of the day, yes i love it that much. Pulao goes for a quick preparation when compared to biryani.Vegetable or beans anything works wonder in pulao and i love to add both vegetables and beans together in pulao just to feed my kids easily as they love pulao or biryanis very much. 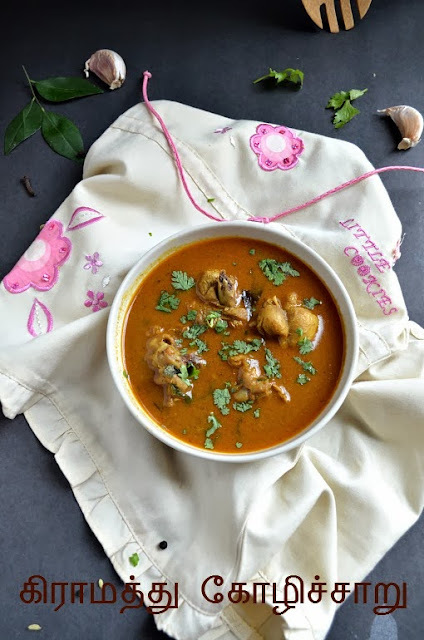 This wonderful one pot meal suits prefectly even for a sunday lunch and tastes more delicious when served along with spicy chicken curry or paneer based curry. Today am here with an another quick,nutritious and flavourful pulao i prepared with butterbeans and with a spiced coconut milk. 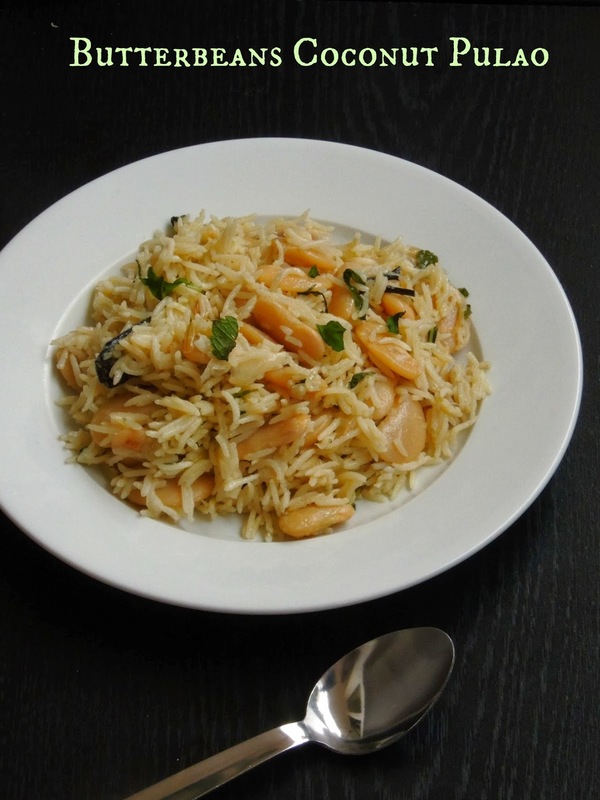 This pulao may sounds almost like ghee rice or coconut pulao but the addition of butterbeans make it more interesting. I didnt add any veggies but still you can add vegetables like green peas,carrot and beans. If you dont like butterbeans, just replace it with paneer cubes.Its 2nd sunday of the month and since i belong to a group of friends who blogs on sunday for the event Let's Brunch On Sundays am posting this incredible,aromatic and nutritious one pot meal today. Do you know the main motto of this event is to blog on sundays since most of the bloggers couldnt able to feed their blog babies during weekdays coz of their busy schedules, so myself and Veena both planned to create an event to cook and post a dish which goes under Sunday brunch,lunch or dinner.Sending MLLA 64 guest hosted by Lourdes Princy, event by Lisa and Susan. Halloween is around the corner and for our this month's Home Baker's Challenge, Nalini suresh of Nalini's Kitchen was the host of this month. She chosed a couple of spooky halloween bakes and i was very eager to bake this spooky witch fingers she suggested as soon as possible. 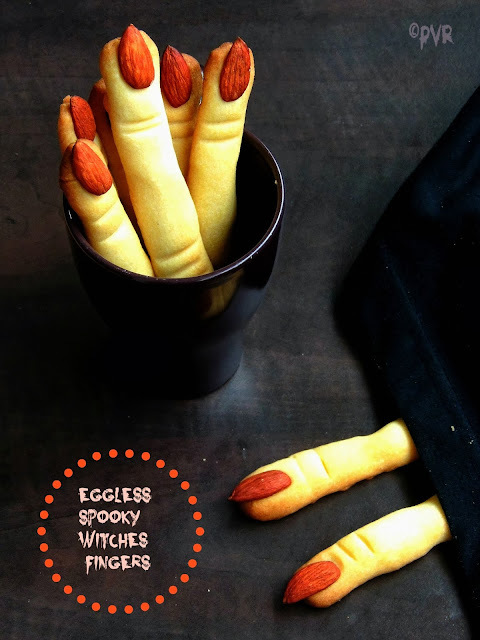 Yes these witch fingers are in my to do list since ages i must say, last year i really wanted to make this fingers but finally i couldnt make coz of few changes with household stuffs also none at home was interested to eat these spooky fingers,so i gave up this bake. But this year, i was really excited when Nalini chosed this spooky witch fingers. The recipe Nalini suggested was with an egg, since i dont want to make with egg, i chosed to make mine as eggless. I tried these fingers with a basic butter cookies dough and these spooky witch fingers came out extremely prefect. Beware they are very much addictive. Eventhough they are spooky,my kids simply loved munching them for their snacks. Mousse is a french word which means something light and airy in texture. Mousse is a type of airy texture food either prepared as a sweet or savoury goes for light and fluffy to creamy and thick texture. Dessert mousses are made typically with whipped egg whites or whipped cream, they are usually flavoured with chocolate or a with fruits puree, mousse dessert are served after a heavy meal and this light dessert will suits prefectly for many occasions and sometimes chocolate mousse is used for making frosting cakes or in entremets, a variety of single serving desserts. Coming to today's chocolate mousse its completely egg free, gelatin free. 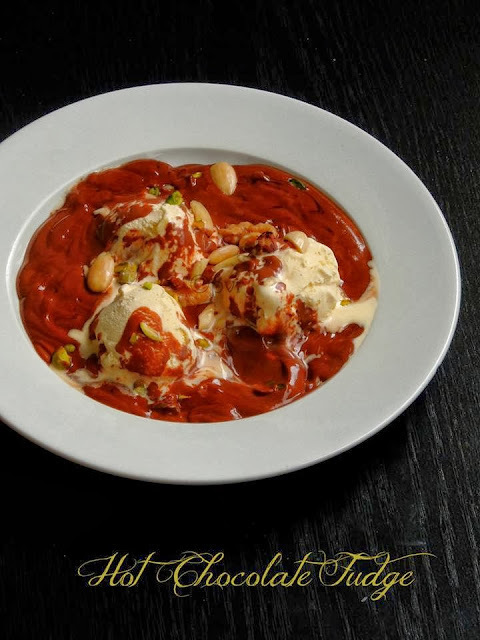 A very light and delicious dessert prepared with milk, cream,agar agar,melted chocolate and cornflour. This mousse is extremely easy to prepare and seriously gets vanished very much quickly too.This is my third post for this week's blogging marathon under the theme chocolates..Check out the Blogging Marathon page for the other Blogging Marathoners doing BM#33..
Brownie is a flat,baked squares or bar prepared usually with fudgey,cakey like texture. A brownies is a cross between a cake and a cookie. They may includes nuts,whipped cream,chocolate chips or many more ingredients, a variation made with brown sugar and without chocolates called blondies is also a kind of brownies. Brownies goes awesome for desserts, in most of the restaurants they are served with a scoop of icecream,whipped cream, or simply sprinkled with powdered sugar. 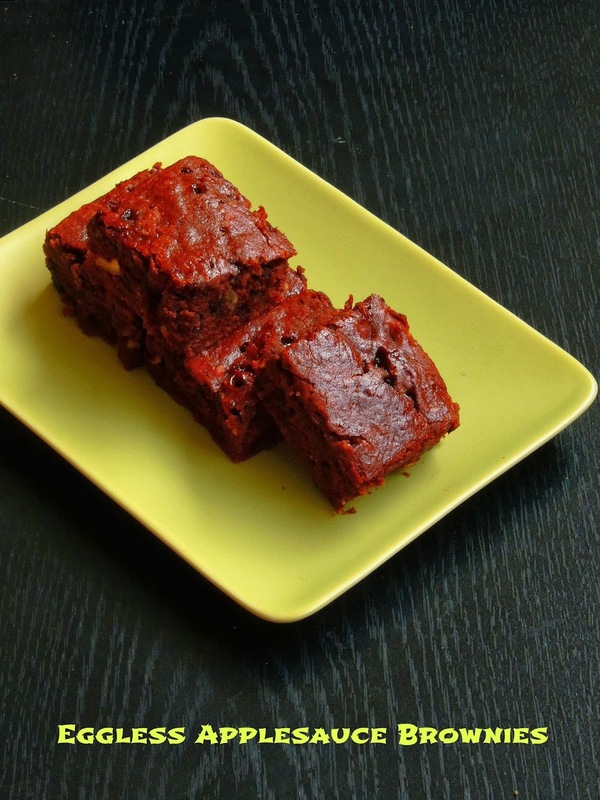 Kids can carry very well brownies in their lunch box and they are typically eaten by hand. Today am sharing a super moist, very chocolatey and very fruity brownies prepared with homemade applesauce. These brownies are lower in fat than most of the brownie recipes and its tastes seriously delicious since this brownies goes for loads of nuts and chocolate chips. An easy brownie to make and enjoy anytime of the day with your favourite drink.This eggless,butterfree and lowfat applesauce brownies suits prefectly for this week's blogging marathon as i chosed chocolates as my theme.Check out the Blogging Marathon page for the other Blogging Marathoners doing BM#33. You can use storebought apple sauce or else homemade, i simply cook some apple chunks with enough water and grind them as thick apple sauce, you can either spice them with cinnamon or cardamom,but for this recipe we need unflavoured applesauce.Sending to Srivalli's Cake Mela. Crème caramel or caramel custard is a custard dessert with a layer of soft caramel on top, as opposed to crème brûlée, which is custard with a hard caramel top. The dish is eaten throughout the world eventhough is dessert is from French Cuisine.Crème caramel goes for a plain custard where sugar syrup cooked to caramel stage is poured into the mold before adding the custard base. It is usually cooked in a bain-marie on a stove top or in the oven in a water bath. It is turned and served with the caramel sauce on top, hence the alternate French name crème caramel renversée. But my version of No Bake Eggless Créme caramel doesnt need a oven and its completely egg free, this dessert goes for custard flour, Full fat milk,cocao powder, sugar and agar agar. Just with simple ingredients you can make an incredible french dessert even if dont have oven at home. 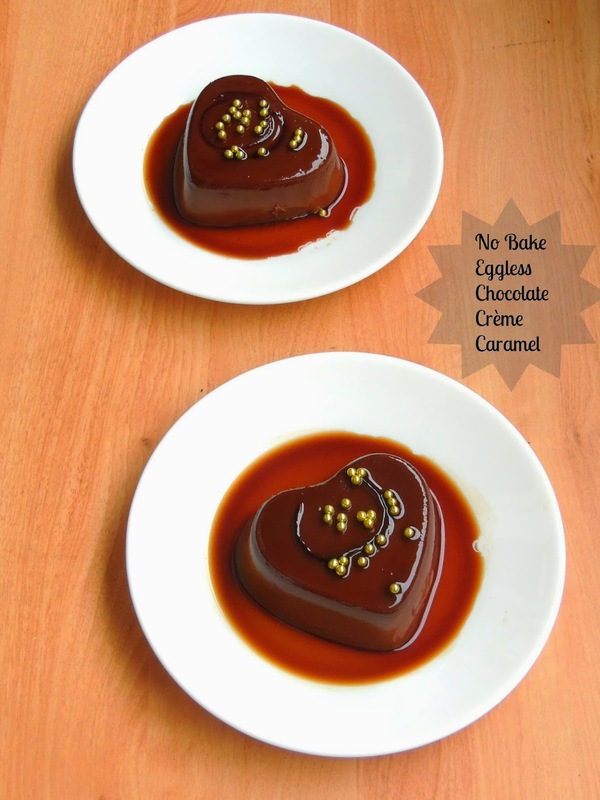 Have you noticed that this dessert is also gelatin free, i used china grass aka agar agar in this créme caramel, if you want to make with gelatin feel free to use it.Am running my second week of blogging marathon from today and my theme of this week is chocolates. .Check out the Blogging Marathon page for the other Blogging Marathoners doing BM#33.. I love crispy dosas especially for my dinner coz am not a breakfast person and i take hardly Indian dishes for my breakfast. Obviously we love to have idlies or dosas for our dinner quite often, this time i tried my hands in making dosa with soyabeans and they came out extremely crispy and tastewise i couldnt find anything different from the usual dosas.Seriously the addition of soya beans makes this usual dosa more nutritious and healthier than the usual dosas. 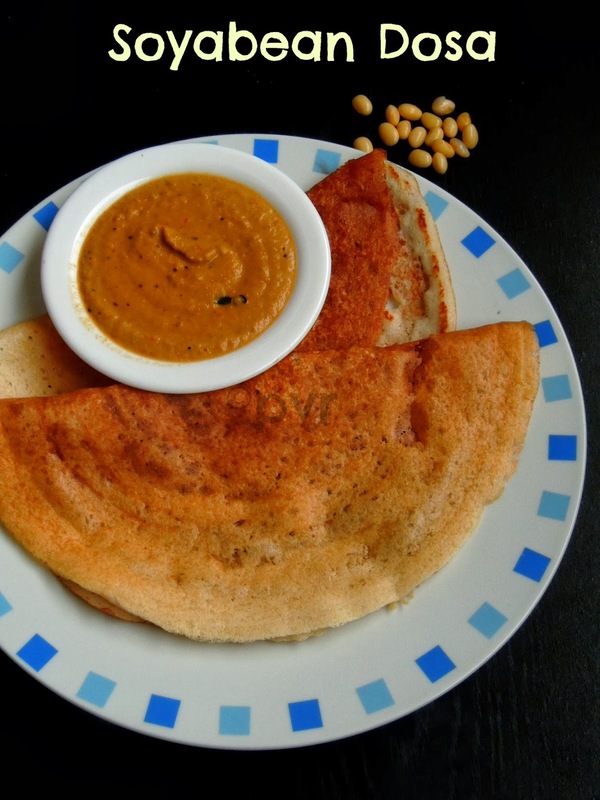 Finally i finished some leftover soya beans sitting in my pantry and happy that i got these crispy dosas out of them. Actually when i revealed about the addition of soyabeans to my family, they were really surprised. Soyabeans are good for health especially for a healthy heart and this legume is used in many ways in East Asian cuisines.Soyabeans may look tiny but healthwise they are higher in protein, just add in your diet atleast once a week or atleast twice a month. Lassi is a summer drink, we love to drink while the weather is hot outside. Not only during summer, i love to drink this fantastic drinl even during the weather is cold or rainy. Amla aka gooseberries have so many medicinal value and its advised to have this fabulous healthy berries quite frequently in our diet. For my surprise, we are getting super fresh gooseberries in Indian groceries often here, obviously i cant forget to get them and add them in my cooking. One of my recent favourite lassi is this healthy,aromatic and refreshing drink with gooseberries and fresh basil leaves. Trust me this combination works simply fabulous and i just loved drinking this healthy drink. If you want to make something different with these healthy gooseberries just make this summer drink.Sending to my event Healthy Diet- Heart Healthy Recipes guest hosted by Sandhya..
Twice a month am introducing newbie bloggers to this immense blogging virtual world, just to showcase their blogs with their guest posts they prepred specially for me and i named the event as Rendez vous with a foodie. Many new fellow bloggers came towards me to join this event and shared their fabulous dishes since ever i started this event. Happy that this event is going successfully since the month of march and i came to know more about my guest hosts through their replies they shared for my questions. Each and every posts of my guest hosts are unique in their own way. Today is 7th october and its time for an another guest post, today's host is very much close to my heart.Life is beautiful when you are surrounded by simple and broad minded peoples as like you, couple of months back my days were not that much funfilled as like now. Yes few buddies from this immense virtual world came very much closer to me and i got a bunch of close friends to whom i can share my happiness and sorrows, trust me they are my family now, eventhough we never had a chance to meet personally, virtually the bond between us is getting more closer and closer.One among those kind hearted and very humble person is Nalini suresh of Nalini's Kitchen, eventhough she is very busy with a young boy and a toddler baby gal she blogs quite frequently. Seriously i admire her enthu and loves her fabulous dishes she shares in space. I can talk for hours about Nalini, she is a very jovial person she can change her environment in a couple of second with her humour. Many peoples can come and go in your life but only few will stay with us, Nalini is one among those person very special for me.Nalini is a wonderful,sweet,honest,modest, down to earth and a humble heart, who will get very much easily closer to you. I love her space, she shares many beautiful dishes with eye catchy clicks, anyone can learn easily with her detailed stepwise pictures. When i asked Nalini to make this guest post, i asked her to share some village style foods coz my space have rare numbers of village style foods.She was kind enough to accept and send me a fantastic village style food,which makes me nostalgic. Lets hear from Nalini of Nalini's Kitchen..
Today I am so excited to do a guest post in one of a well known blogger Priya.She is one such caring person and passinate blogger,never forgets to visit my blog with her lovely words.Though she ia a mom of 3 kids her dedication towards blogging is amazing and like the way she posts.She is a wonderful baker and all her baked goodies are super duper. When Priya came up with the idea of rendez vous for newbies I was really happy and excited. 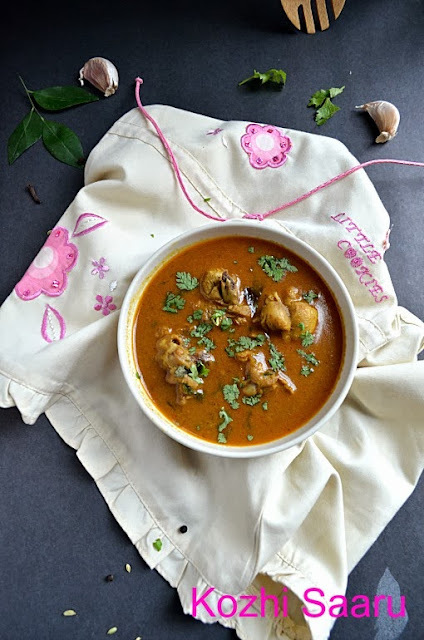 Coming to the recipe,its a village style chicken recipe which is a stew like preparation popular in Southern part of Tamilnadu.This saaru/stew goes very well with Idly,dosa,idiyaapam and even plain white rice. I am Nalini Suresh,full time home makerlives in U.S with my hubby and 2 kids.I blog under Nalini's Kitchen which is 2 years old. I always have a passion towards cooking and like to do lot of experiments in the kitchen.So I don't feel any changes after I start the blog except the interest towards photography and props hunting. Couple of my friends motivated me to start a blog after tasting my foods and my hubby dear supported me to start a blog.He helped me a lot to create the template and buying props.All the credit goes to him. I cook simple,healthy South Indian vegetarian and non vegetarian food and eggless baking.Most of my recipes are with stepwise pictures which would be very helpful for the beginners. Of course its my mom.Being a full time working mom she cooks and feed us delicious and the same time a healthy food.She has lots of interest and passion towards cooking and trying out new recipes. I have lots of technical issues in my blog which I cannot fix it.My hubby dear and my friend Revathi helped me a lot to come out this issue. 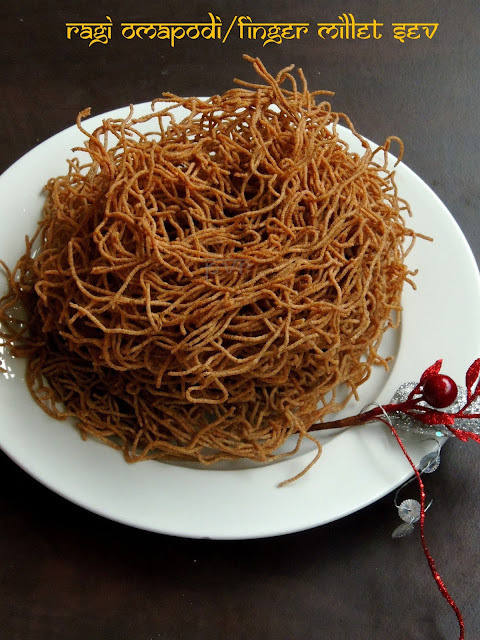 Next thing is I was not aware of the social medias like Facebook,Pintrest.Sangee of Spicy treats helped me a lot. All my recipes are favorite,the best ones are karivepillai kulambhu,kathirikkai konda kadalai kulambhu,Pepper chicken,mutton sukka and my native's special sweet Asoka Halwa. Take pictures in the natural light with a decent and neat presentaion. Don't use flash and try to take pictures in a day light. Try to take pictures in different angles. I don't have any bugets but I make sure the buget won't go beyond 10USD.I have interest towards buying the culinary gadgets and crockery before blogging,so I use some of my household stuff also. But now the interest has become more and whenever I go for shopping never forget to get a small prop for my blog,it doesn't matter if its a big mall or dollar store. I try to post 4-5 recipes per week but these days with a year old active girl at home its really difficult to post like before so i limited to 2-3 posts per week. Yes,I do embroidery,knitting and painting.But these days with my lil one its hard to find time to do,so I do it rarely. Wash and clean the chicken and cut into bite size pieces.Add the turmeric,red chilly powder and 1/2tsp of salt to it and mix it well. Heat a pan with 2tsp of oil,crackle the fennel and cumin seeds then add the other whole spices.Now add the shallots,garlic and ginger,saute it till transparent. Now goes in the chopped tomatoes,cook it until mushy,finally add the grated coconut and coriander powder,give it a mix.Put off the fire.Let it cool down completely,grind it to a fine paste. Heat the pan with the remaining oil,once the oil becomes hot saute the onion,curry leaves and green chilly till transparent.Add the chicken pieces and saute till it changes the color. Now add in the ground masala paste,salt and mix it well.Add 3 cups of water to it and cook it covered in a medium flame till the chicken becomes tender and soft. Finally sprinkle the chopped coriander leaves and put off the fire. This curry needs to be slightly watery so adjust the cocnsistency accordingly. If you want to use ginger and garlic paste omit the whole ginger and garlic while sauting and use it while making the curry,after the onion is sauted. 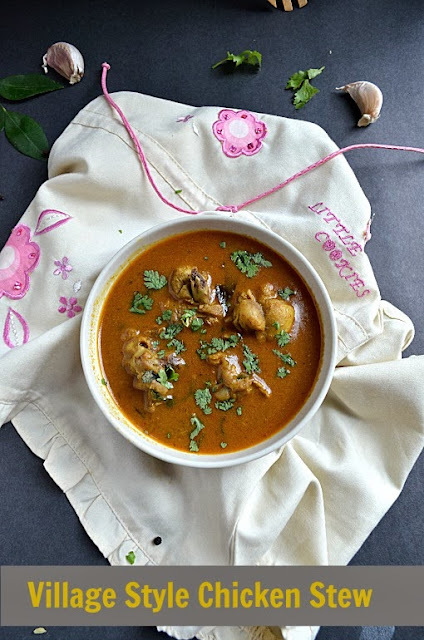 Hope you all enjoyed Nalini's delicious chicken stew, stay tuned for an another guest post from an another young and newbie blogger soon.